A 1982 postage stamp from Bermuda shows the regimental colours and colour party of the Bermuda regiment. Image from <www.regiments.org>. See also image at <www.bermuda-online.org>. Actually it's a set of six commemoratives of the Bermuda Regiment. 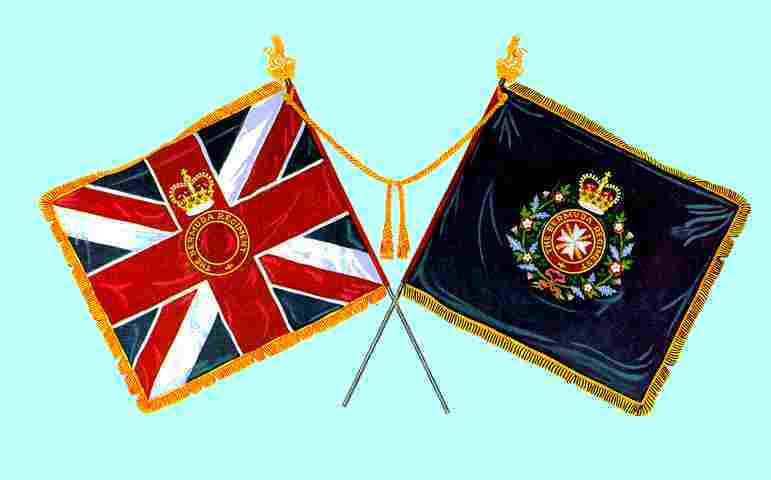 One shows the regimental colours, of which the "Regimental" one is blue with the maltese cross badge of the regiment in the center according to regulations for all British Army colours. Another stamp shows the Queen's birthday parade with two flags prominently displayed. One is the Sovereign's standard, and the other is the Union Jack with the Bermuda badge in the center as mentioned above, but it is not the pre-1801 Jack. It has the St. Patrick's cross. From the context of association with the Sovereign's Standard can we deduce that this is the Governor Flag? Images based on photo sent by Aidan Stones , 18 March 2000. One is a dark blue with emblem and the other is Union Jack (per British Army specs). The stamp has a face value of "10c" (cents?) and says "Bermuda Regiment":" Regimental colours and colour party".